This article is part of a series documenting my first foray into FPGA programming. You might find it helpful to read the summary article1 first. Updated in Jan 2019: Kees Jongenburger pointed out that the clock in on pin 21, not pin 12 as it used to say below. Thank you Kees. The iCEstick2 is a USB-stick style board, made by Lattice. Now let’s tackle the hardware. Unpack the iCEstick and plug it in. The hardware is now ready! If you have a frequency counter to hand, measure the frequency on test point A: it should be about 6.3MHz. If you prefer something slower, you should find a frequency of about 0.7Hz on test point B. Full schematics of the board are available in the user manual5. Here are some highlights, relevant to our simple project. The FPGA is a iCE40HX-1K in a 144-pin quad flat-pack. A 12MHz clock from a ceramic resonator is provided on pin 21. As you can see the PLL can’t generate a 100MHz clock, so we will use 100.5MHz instead. Notice too, that icepll helpfully writes the relevant verilog to a file. Sadly though, that verilog doesn’t use the global clock buffer, so it needs to be tweaked by hand. Four red LEDs are connected to pins 96–99; a green LED is connected to pin 95. Dozens of spare IO pins exist, and we use two as test points: pins 44 and 45. 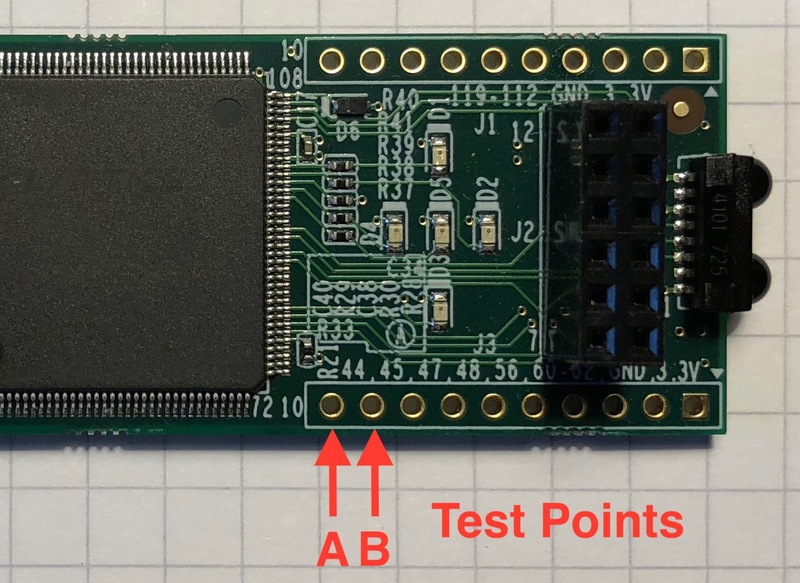 The board has a FTDI 2232H USB interface which can be used to program flash on the board with iceprog from the IceStorm Tools. However, unless you are prepared to wield a soldering iron, the SRAM in the FPGA can not be programmed directly. The manual also contains details of the other peripherals on the board, and, for example, how to use the FTDI chip to talk to a UART on the FPGA. Our needs are more specialized though. Please remember that you can download all of this from GitHub6. There are only four small files: a couple of bits of verilog, the pin definitions, and a Makefile. The code is very much as you’d expect. There’s a simple binary counter to reduce the clock frequency to something manageable, then a bit of sequential logic to drive the LEDs. * Make circular pattern on red LEDs, flash green LEDs. * Generate test signals at 6.28MHz and 0.749Hz. The PLL code is generated by icepll, then edited to use the global buffer for clock distribution. Technical note TN12517 discusses clocks and PLLs on the iCE40. * using the icepll tool from the IceStorm project. Revised by Martin Oldfield on 29 Jan 2019, original version 27 Feb 2018.